Small Business School, Inc. - #9 Human-to-Large Scale transitions between Steps 134 to 138. #9 Human-to-Large Scale transitions between Steps 134 to 138. Let's focus on step 136. Half of 136 is 68 and added together is 204. Now, 874 miles doesn't seem Large Scale unless, of course, you go straight up. 874 miles up gives you a rather large view of the world. Could it be possible that this is the major transition to the large-scale universe? Might it be as dramatic as the transition from the Small Scale to the Human Scale with its particles becoming atoms and the Periodic Table? We offer some highly-speculative guesses. Remember that inherent geometry continues. The parallel constructs continue. There is a deep-seated continuity, symmetry, and harmony that give this universe its coherence. Highly-speculative thoughts: Major transitions in science often involve some kind of tunneling. Might that be true here? Could there be a major convergence of forces to create an Einstein-Rosen Bridge? That is the initial physics for a wormhole and physicists have speculated that it may be an opening in the universe to take a shortcut to travel throughout the galaxy. Here we are on steps 134 to 138, the range that doubles 67-to-69 (134-to-138 respectively) to get into the range of the Observable Universe between 202-to-206 notations. 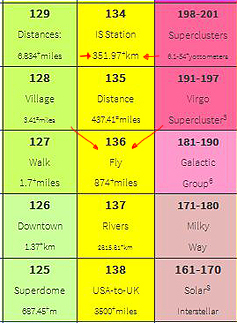 Step 134 (218.7+ miles) is within the range of the International Space Station. Step 135 is about 437.5+ miles up. Then, consider Step 136 (875+ miles), step 137 (1750+ miles) and step 138 (3500+ miles). 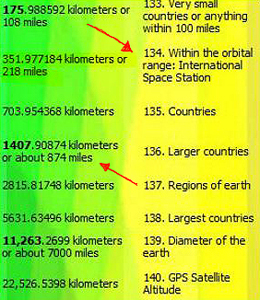 The GPS satellites are 14,000± miles up. How and why would these possible wormholes manifest within this notational range? Surely, it is wildly speculative. Notes about Look-and-feel and Navigation: Below the line is for footnotes, endnotes, and personal notes. Usually if you click on the last sentence in each description you will go to the next page.